Written by Tim Ingham — It’s not been a great 24 hours for Jay Z. First, it was revealed that his TIDAL streaming service is being sued for $5m as part of a class action lawsuit related to unpaid mechanical royalties. And now we discover the platform has lost two of its most influential executives in quick succession. According to Swedish news site Breakit, CFO Chris Hart has been fired – very likely over the platform’s policy of not sharing its data with Nielsen Music in the US. Because of that policy, Kanye West exclusive The Life Of Pablo – a big moment in the history of TIDAL – failed to make any significant impact on the Billboard 200 chart last month. Embarrassing for all involved. Perhaps a head had to roll? Hart has held the CFO position since 2014, and has worked at Jay Z’s company since 2012. Meanwhile, Norwegian newspaper Dagens Næringsliv reports that COO Nils Juell was removed from his position in the past week. Juell told the newspaper that he was on holiday and declined to comment. 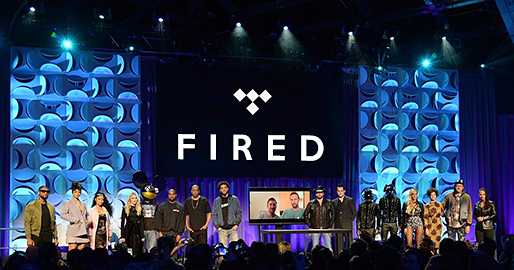 The departures are the latest in a string of worrying executive exits at TIDAL since Jay Z”s Project Panther Bidco bought the company for around €50m last year. These have included two CEOs (Peter Tonstad and Andy Chen), its Chief Investment Office (Vania Schlogel), its US Sales & Marketing Manager (David Soloman) and its SVP of Label & Artist Relations (Zena Burns). According to a report in the New York Post last week, Samsung has recently been in discussions regarding a potential acquisition move for TIDAL. This year has seen three major exclusives come to TIDAL, all from artists which own a stake in its business. First, Rihanna album ANTI arrived as a windowed exclusive in January. However, its release was marred by an error which saw it uploaded (and subsequently leaked) early – an error for which TIDAL blamed Universal Music Group, and UMG blamed TIDAL right back. Beyonce’s comeback single Formation landed on the platform in February, before The Life Of Pablo was released later in the month. The Kanye West album was reportedly downloaded 500,000 times on torrent sites in its opening 24 hours.